She decided to write a novel in 30 days. She had never wanted to write a novel before, but once she decided to, it was all she could think about. 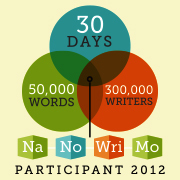 The idea first came to her when she heard of a challenge called “NaNoWriMo.” Write a 50,000 word novel in 30 days. Seems simple enough. So she began. With no plot, no characters, only a word goal. Being the nerd that she is, she quickly determined that in order to write 50,000 words in 30 days, she would need to write at least 1,667 words per day. After some thought, she decided to adjust the goal to 2,000 words per *sober* day. Because, you know, who are we kidding here? We’ll probably lose a couple of days to wine. But perhaps those wine-induced days have something to offer. They will definitely make the novel more interesting. She thought back to the mornings when she’d wake up to the late night scribbles in the notebook lying next to her bed. “I’m still more sober than some of you have been in years” came to mind. Yes, she would definitely include the wine-induced scribbles in the final product. Curious, she checked her word count. 201. Yes, we’re off to a good start. She decided that, given the circumstances, the genre of the novel would definitely be humor/satire. For obvious reasons. And also, the title of her novel would be “Atrocity.” She quickly announced the title of her novel on Twitter and on her NaNoWriMo profile. Because clearly, that would prevent anyone else from stealing it. As an afterthought, she acknowledged that the novel would apparently be written in third person. Maybe she’d come up with a name for the narrator, maybe not. Who knows? Anything can happen when you have 50,000 words, a time limit, and no storyline.